March | 2015 | Minnca! Finally, winter is over and the shelves of our favorite co-ops and grocery stores are again full of wonderful spring produce. In Chinese medicine, spring is perhaps the most important season to make sure you’re eating fresh green vegetables as these foods, especially, promote the health of the liver. Lay the cucumber on a chopping board and smack it hard a few times with the flat blade of a Chinese cleaver (or rolling pin). The cucumber is smacked before cutting to loosen its flesh and help it absorb the flavors of the sauce. Try not to smash it to smithereens! Then cut it, lengthways, into four pieces. Hold your knife at an angle to the chopping board and cut the cucumber on the diagonal into 1/8-3/8 in slices. Place in a bowl with the salt, mix well and set aside for about 10 minutes. Combine all the other ingredients in a small bowl. Drain the cucumber, pour over the sauce, stir well and serve immediately! Place the dried shrimp in a small bowl with the Shaoxing wine and just enough hot water from the kettle to cover them. Set aside for 30 minutes. Bring a large panful of water to a boil for cooking the noodles. Smack the spring onions lightly with the side of a cleaver to open up the white parts slightly, then cut them evenly into 2 ½ – 3 in sections. Pour the soy sauce into your serving bowl with a little salt, if you like. Heat the oil in a wok over a high flame. Add the spring onions and stir-fry until they are turning a little golden. Drain the shrimp, add them to the wok and continue to stir-fry until the spring onions are well-browned and wonderfully fragrant, but not burned. Then set aside this fragrant oil, with the spring onions and shrimp. Boil the noodles to your liking, then drain them well and place them in the serving bowl. Put the spring onions, shrimp and their fragrant oil on top. Mix everything together very well with a pair of chopsticks before eating. – Chinkiang vinegar is sour in nature, slightly warm, and benefits the liver directly. – Spring Onions are pungent, warm, and benefit not only the liver but also the kidney and stomach! – Wheat, garlic and cucumber both benefit the spleen, which is great for digestion in general. The spleen is also directly tied to the liver in Five Element Theory. In the spring it is especially important to nourish the spleen to keep the liver balanced. Honey has been used in Chinese medicine as an herb, a food, and a preservative for thousands of years. In Chinese medicine, honey is known as Feng Mi. Energetically it has a sweet flavor and a neutral temperature; it benefits the Lung, Large Intestine, Spleen, and Stomach meridians. As a medicine it is primarily used to strengthen the spleen and stomach, tonify Qi, and prevent dryness. Taking into account its moistening function, poached pears in a honey sauce make a fine medicinal dessert in the fall to help counteract the seasonal dryness that prevails that time of year. Realizing the perfect preservative nature of honey, ancient Chinese doctors realized it could be used as a delivery system for other more delicate medicinals. One of the oldest forms of herbal preparation is that of the honey pill. First honey is heated to be extremely liquid. Once the honey is flowing like water you add the medicinal powder to it in the proper ratio. The honey/herbal mix is then poured onto a non-stick surface (these days we use wax paper) in lines. As the honey begins to cool and become more viscous, the doctor would roll it between his palms until it became the size of a pea. This is one of the original forms of pill! The Chinese weren’t the only culture to realize the benefits of honey. Modern archeologists, excavating ancient Egyptian tombs, have often found something unexpected amongst the tombs’ artifacts: pots of honey, thousands of years old, and yet still preserved. Through millennia, the archeologists discover, the food remains unspoiled, an unmistakable testament to the eternal shelf-life of honey. There are a few other natural foods that won’t spoil in their raw state; things like sugar, dried rice, and salt for instance. 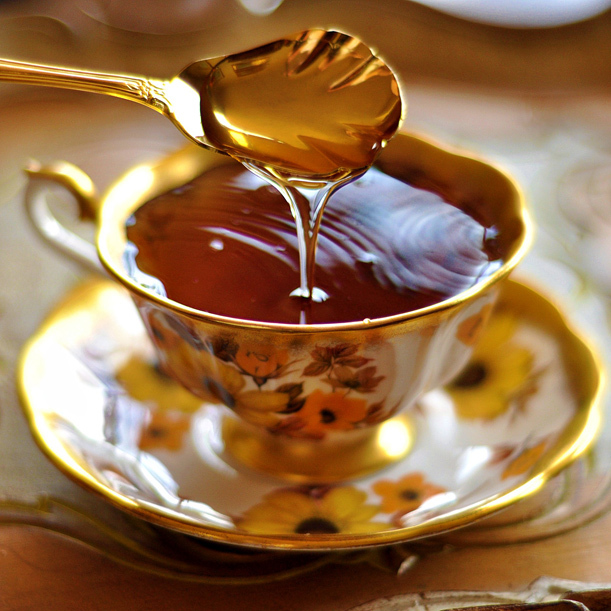 However, honey is unique in that it remains preserved in a purely edible form. You don’t have to prepare a thousand year old jar of honey to eat it; you could pour it straight onto your toast if you’d like.